Everyone has to overcome obstacles to reach their goals. Overcoming obstacles enable people to reach their destination. In our daily life we face many problems. In Dhaka, people daily suffer the difficulty of reaching their destination. People wake up before sunrise and prepare to reach workplace on time everyday facing the battle of getting on buses or on rickshaws and other transports as the buses are always filled with passengers. In Bangladesh, female education is increasing day by day. Likewise women’s employment is also increasing, which is comparatively higher in the capital. But most organisations don’t have transport system for the employees, therefore women struggle in local services like all commuters, suffering crowds and hardships. Women are continuing their journey in spite of being embarrassed, to save time and money. It’s a shame that due to lack of adequate transport women are often being abused in buses. Take a busy place like Science Laboratory, Dhanmondi. Here a huge number of people, including women, move every day. In this route there is just one bus service for women which is operated by BRTC. It goes from Mohammadpur at 8 am to Motijheel via Science Lab and from Motijheel to Mohammadpur at 5 pm. It is not enough to meet the need of women because thousands of women use this route everyday. So, it’s clear that they are compelled to carry out their daily commute in difficult circumstances. BRTC is a semi-autonomous corporation under communication ministry for providing transport services to the people. According to BRTC, they started the bus service for women in 1999 with a double-decker bus. In 2009, they launched another bus and currently it has 17 buses in 15 routes, of which seven buses are double-decker. 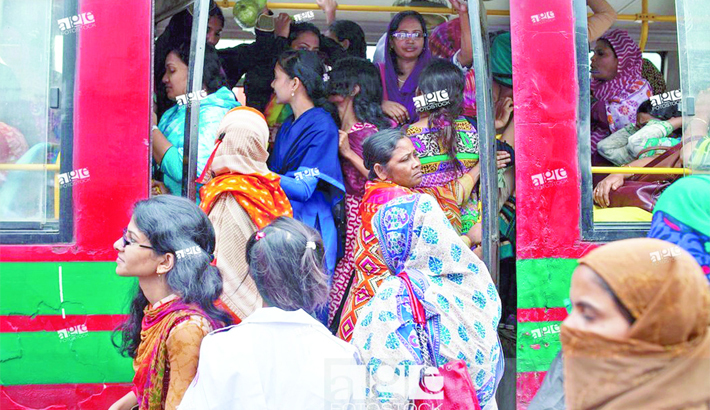 A study in 2014 revealed that in Dhaka there are some 57,03,908 female commuters, including school and college girls. Even if each bus carries 500 passengers in the span of the whole day, 17 buses are not enough to reduce the transport problem of women. But recently a private agency called ‘Dolonchapa’ has started bus service in the capital only for women. Two AC buses are running from 7 am to 8 pm daily. Initially, the service is running on Motijheel to Azimpur routes. However, the company assures that they will start eight more buses in the next two months and this is undoubtedly a good initiative. `Women are insecure in capital’s transportation”- is not untrue, because daily news reports many occurrences related to the oppression of women on buses, road sides, etc. We also see various kinds of videos in social media in which women are harassed regularly. Therefore, government should take some effective steps to facilitate secure transport system for female commuters. As the government is developing the country in every area therefore it should also ensure adequate number of buses for women to reduce harassment of women in public transports. Although it is the responsibility of government to provide sufficient conveyances for women to protect them in the road and ensure their safe movement, but if some NGOs co-operate with the government the problem of bus service for women can be solved soon.